I’ve always find it weird how much ‘less’ of a good chair you get now and how much ‘more’ they cost. – backup and then update. With such a gain – now you need smarter decisions being made in IT – better protection and prevention methods. 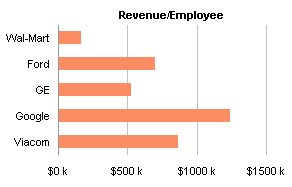 How do you think the big players above drive so much revenue per employee? Post 2010 – this is industry agnostic. Software solutions are out there for every type of company.